21st Amendment Hell or High Watermelon | Drink. Blog. Repeat. I’m a man. A real man, damnit. I like steak and sports and alcohol that makes me grimace when I drink it. I like the heavy stuff – REAL beer for a REAL man – so I don’t give in to some frou-frou fruit-flavored wheat beer. Except this one. This one’s pretty good. 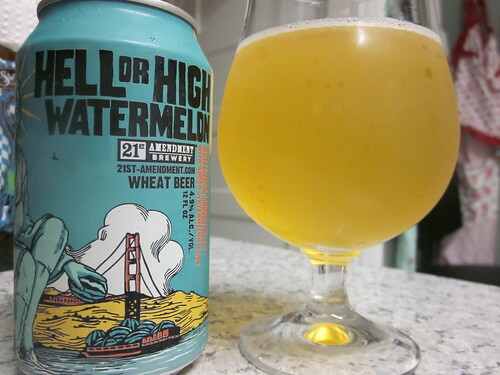 21st Amendment‘s Hell or High Watermelon is a sessionable 4.9% wheat beer the brewery puts out every summer. After brewing a classic American-style wheat beer, they put the beer through secondary fermentation with fresh watermelon. Then they top it off with a bit more watermelon juice. Like a wheat beer, it pours a very hazy straw yellow/sunrise/blonde color. There’s maybe half a finger of head but it’s gone before you know it. No lacing and very weak alcohol legs. All expected for a light beer of the style. The nose has the standard big rich wheat notes and a really strong watermelon smell. While a lot of fruit beers go for overpowering fruit, the watermelon is very subtle and not overly sweet smelling. It’s not artificial at all. Just a very slight hoppiness to it. There’s a very nice tartness on the tip of the tongue. There’s effervescent and bubbly carbonation throughout the mouth. The watermelon flavor is immediately present in the middle of the mouth and again on the back. Again, it’s not overpowering or artificial, which is something they pride themselves on. It’s the right balance of sweet and tart. On the back you get that smooth wheat and a clean sweet finish. It’s perfect for summer sipping. The fact they use real watermelon is a big plus. The beer is just the right amount of sweet, a little tart and extremely smooth and drinkable. I could easily see myself going through a six-pack poolside. It takes a real man to say that. So I made a watermelon wheat this summer because I had this and thought – where’s the damned watermelon? For food and beer, my palate craves big, bold flavors and I thought this brew was too weak on watermelon. I triple-watermelon brewed my batch and that certainly did the trick. Oddly enough, I think I’d like the wheat base beer more than what they created with the fruit. This is the only 21st Amendment beer I don’t think is awesome. I certainly think the rest of their catalog is much better, but on a broiling-hot day, this is more or less the perfect beer, in my opinion. As I said, I like the fact it’s not artificially or overly sweet. I definitely get a lot of watermelon off it. I can imagine it would be a solid wheat beer without the fruit as well. I think that’s right as well – great mid-summer beer to waste the day away with. Responsibly, of course. Pingback: My Top 5: Breweries I Want to See in South Carolina | Drink. Blog. Repeat.